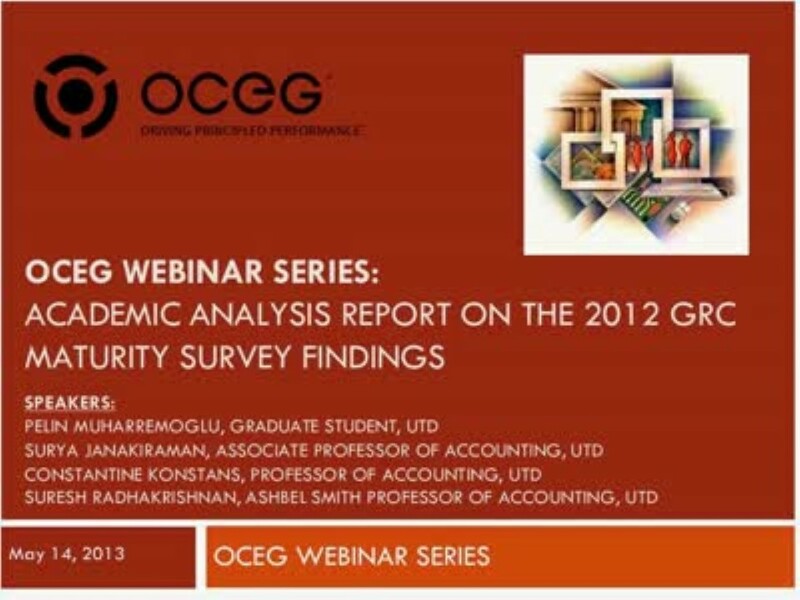 Join us for a deep dive analysis of OCEG’s 2012 GRC Maturity Survey. More than 500 executives from a wide range of companies, representing a broad band of industries in many countries, participated in the GRC Maturity Survey regarding the current state of GRC integration. This webinar will present analysis of the data by a team from the University of Texas-Dallas Institute of Excellence in Corporate Governance. We have emailed instructions to access Academic Analysis Report on the 2012 GRC Maturity Survey Findings Slide Deck to . Make sure the email arrives in your inbox: either add "support@oceg.org" as a safe sender to your email platform, or if you use Gmail, drag our email into your Primary tab.